If you're looking for a great (and cheap!) hotel in Madrid, CheapTickets is the best place to find them. We offer deals on the best 1196 hotels throughout Madrid. No matter what you're looking for, we have options for you. Grab great rates on the 459 affordable 3-star hotels that are easy on the wallet without sacrificing comfort. Looking for more luxury? 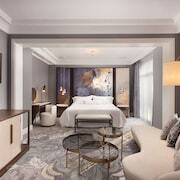 Try one of the 258, 4-star hotel accommodations in Madrid. No matter your budget needs, we've pulled out all the stops to make sure you have plenty of vacation options. Maybe you prefer to search for your hotel deals based on what each hotel offers? For example, let's say you just want to find a hotel or resort that has a pool to cool off in after a long day exploring Madrid. Scroll down to choose from the 100 hotels in Madrid that has a pool for guests. Or search for deals on Madrid hotels offering free wifi or breakfast, non-smoking rooms, and more! CheapTickets is here to be your personal travel agent for your next trip to Madrid. Get booking today! What hotels in Madrid offer free wifi access? Suites Viena Plaza de EspaÃ±a, a 3.00 star hotel in Madrid that offers free wifi access for guests. MeliÃ¡ Castilla, a 4.00 star hotel in Madrid that offers free wifi access for guests and has rooms starting as low as $334.00 per night. 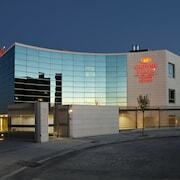 Hotel Emperador, a 4.00 star hotel in Madrid that offers free wifi access for guests. Vincci VÃ­a 66, a 4.00 star hotel in Madrid that offers free wifi access for guests. Are there deals on Madrid hotels offering free breakfast? Yes! The only thing better than finding a great deal on a cheap hotel in Madrid is finding one that offers free breakfast. Grab some eggs, a waffle, or some healthy oatmeal before a day full of exploring Madrid and all that it has to offer. Below are just some of the many hotels that offer free breakfast in Madrid. Petit Palace Posada del Peine is a 4.00 star rated hotel property in Madrid that offers free breakfast. 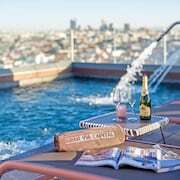 60 Balconies Urban Stay is a 3.50 star rated hotel property in Madrid that offers free breakfast. Hotel Nuevo Boston is a 4.00 star rated hotel property in Madrid that offers free breakfast. Hotel Nuevo Boston room rates start as low as $104.00 per night. Hotel Mayerling is a 2.00 star rated hotel property in Madrid that offers free breakfast. What about deals on pet-friendly hotels in Madrid? Madrid is a great place to get outside and explore with your pets in tow so don't leave your furry friends behind. Below you'll find great deals on hotels in Madrid that allow pets. Don't forget to bring plenty of treats! Eric VÃ¶kel Boutique Apartments - Atocha Suites is a popular, pet-friendly, 4.00 star hotel in Madrid. Room rates start as low as $149.00 per night. Axor Feria is a popular, pet-friendly, 4.00 star hotel in Madrid. Room rates start as low as $94.00 per night. 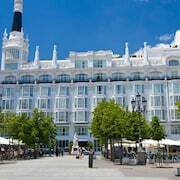 WooTravelling Plaza de Oriente HOMTELS is a popular, pet-friendly, 3.50 star hotel in Madrid. Hotel Principe Pio is a popular, pet-friendly, 3.00 star hotel in Madrid. Any good rates on Madrid hotels with restaurants? Absolutely. Don't want to deal with planning our all your meals on your trip to Madrid? We don't blame you. Keep the hangry away by staying in one of the 250 hotels that have restaurants. With a room at one of these spots, all it takes to get a good meal is hopping in the elevator. Check out some of the most popular hotels in Madrid that have restaurants below. Book Hotel ILUNION Atrium Hotel ILUNION Atrium is a 4.00 star hotel and has one or more restaurant options. Book Dormirdcine Cooltural Rooms Dormirdcine Cooltural Rooms is a 4.00 star hotel and has one or more restaurant options. Book Iberostar Las Letras Gran Via Iberostar Las Letras Gran Via is a 4.00 star hotel and has one or more restaurant options. Book Luxury Suites Luxury Suites is a 4.00 star hotel and has one or more restaurant options. What are the cheapest hotels in Madrid with pools? 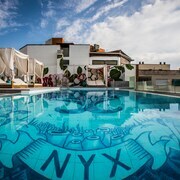 What's better after a long day exploring Madrid then a relaxing dip in a pool? Finding the Madrid hotel you need for a bargain! Cool off and unwind at one of our 100 Madrid hotels with a pool. 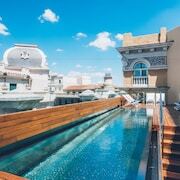 Browse some of the top deals on these hotels and resorts with pools in Madrid below, but be warned: You may not want to check out! 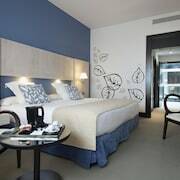 Novotel Madrid Puente de la Paz has a pool and a 4.00 star rating. Hotel Atlantico Madrid has a pool and a 4.00 star rating. With room rates starting at just $196.00 per night. Room Mate Mario has a pool and a 2.00 star rating. Hilton Madrid Airport has a pool and a 4.00 star rating. What hotels in Madrid offer parking for guests? Once you've made your way to Madrid, the last thing you want to deal with is finding parking close to your hotel. Avoid the hassle of parking around the block and carrying your luggage all the way to the lobby by booking one of our hotels with parking. Check out deals on some of the 376 hotels in Madrid that offer parking for guests. Apartosuites Jardines de Sabatini This hotel has a 3.00-star rating. Rafaelhoteles Atocha This hotel has a 4.00-star rating. Petit Palace Plaza del Carmen This hotel has a 4.00-star rating. Jc Rooms Santo Domingo This hotel has a 3.00-star rating. Do Madrid hotels offer 24-hour concierge services? When you're on vacation, things don't always go according to plan. Travel with peace of mind when you book one of our 234 hotels in Madrid with 24-hour concierge service. That way you know help is always phone call or elevator ride away. Try Agumar Hotel. It's a 4.00 star rated hotel in Madrid that offers concierge services 24 hours a day. Try Hotel Paseo del Arte. It's a 4.00 star rated hotel in Madrid that offers concierge services 24 hours a day. Try Compostela Suites Apartments. It's a 3.00 star rated hotel in Madrid that offers concierge services 24 hours a day. Try Luxury Suites. It's a 4.00 star rated hotel in Madrid that offers concierge services 24 hours a day. What about low rates on non-smoking hotels in Madrid? Luxury Suites This hotel has a 4.00-star rating. Hotel Madrid Gran VÃ­a 25- managed by MeliÃ¡ This hotel has a 3.00-star rating. Hotel Quatro Puerta Del Sol This hotel has a 4.00-star rating. Hotel Liabeny This hotel has a 4.00-star rating. What are the cheapest Madrid 3-star hotel deals? Our 3-star hotels bring you quality accommodations at a lower price point for the perfect, budget-friendly vacation in Madrid. With 459 3-star hotels throughout Madrid to choose from, you still have options. Browse our selection below. Room Mate Ã“scar. Located in Chueca, this hotel is within a 10-minute walk of San Anton Market, Puerta del Sol, and Thyssen-Bornemisza Museum. Prado Museum and Plaza Mayor are also within 15 minutes. Hotel Principe Pio. Located in Madrid City Centre, this hotel is within a 10-minute walk of Campo del Moro and Plaza de Espana. Plaza Mayor and Royal Palace are also within 1 mi (2 km). WooTravelling Plaza de Oriente HOMTELS. Located in Madrid City Centre, this apartment is within a 10-minute walk of Campo del Moro and Plaza de Espana. Plaza Mayor and Royal Palace are also within 1 mi (2 km). Hotel Regina. Located in Gran Via, this hotel is within a 5-minute walk of San Fernando Royal Academy of Fine Arts and Puerta del Sol. Plaza Mayor and Thyssen-Bornemisza Museum are also within 10 minutes. 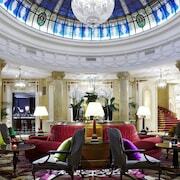 What are the best deals on 4-Star Hotels in Madrid? Madrid is full of hotels and it can be hard to narrow down where you really want to stay. Luckily, we've done that hard work for you be narrowing you from 1196 hotels throughout Madrid, to the 258 4-star hotels in Madrid. Our 4-star hotels in Madrid are exactly what you need for your next family trip, romantic weekend, or solo getaway. Check out our most popular deals below. Gran VÃ­a Capital: Located in Gran Via, this apartment is within a 10-minute walk of Plaza de Callao, Plaza Mayor, and Plaza de Espana. Puerta del Sol and Royal Palace are also within 15 minutes. Hotel Atlantico Madrid: Located on central Madrid's main artery, the Gran Via, opposite Plaza Callao, this historical building reflects early 20th-century eclectic style with ornate stucco work topped by a French cupola. Find great deals on rooms starting as low as $196.00 per night. Hotel Emperador: Grand hotel on Madrid's famous central thoroughfare of Gran Via, less than 1 kilometer from Plaza Mayor, Royal Palace, and Puerta del Sol, and 2 kilometers from the Prado art gallery, and Retiro Park. 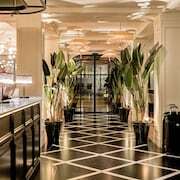 Vincci The Mint: Located in Gran Via, this hotel is within a 10-minute walk of San Anton Market, Thyssen-Bornemisza Museum, and Puerta del Sol. Prado Museum and Plaza Mayor are also within 15 minutes. What are the best activities to do in Madrid? Avila With Walls & Segovia Full-Day Excursion: Starting at just $105 per person. Half-Day Highlights of the City Tour: Starting at just $35 per person. Toledo, Escorial & Valley of the Fallen Full-Day Excursion: Starting at just $135 per person. Escorial & Valley of the Fallen Half-Day Excursion: Starting at just $82 per person. Excellent location, very clean rooms. Two areas that could improve is that the beds moved when sitting up against the headboard, I had to push the mattresses back into place. The shower door should be enclosed more, water spilled out of the shower tub due to that. The hotel was renovated,and looks great. Enjoyed the cleanliness, and that no noise could be heard from streets. Staff was very friendly and accomodating. Will definitely return. I love everything about this hotel! From the front desk to the housekeepers, everyone is amazing. The location of the hotel is perfect and situated right in the center of the city of Madrid. All major landmarks and everything you need to see in Madrid are within walking distance. They have a rooftop and a lounge upstairs. Don’t forget the 360 degree view of the city at the very top dome of the hotel. Right outside the hotel, you will find all shopping stores and restaurants. I highly recommend this hotel for family and friends. Excellent hotel in a great area. All clubs, bars, and restaurants are in 3 to 5-minute walking distance. Staff super friendly. Highly recommend! Great newish hotel at a great rate, best quality to price ratio around the airport. Even though I have top elite status with several other brands, their deal was just too good to pass up. My only slight dissapointment was the bed headboards are a bit uncomfortable, but can fix with a couple of pillows.